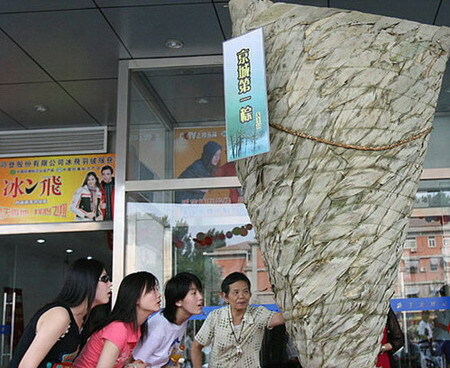 The filling of the two-meter-tall zongzi comprises 150 kilograms of glutinous rice and 50 kilograms of red dates. The super pyramid-shaped rice dumpling was set up in celebration of the traditional Chinese Dragon Boat Festival on Tuesday, on which day it is a long-standing tradition to eat zongzi. The Dragon Boat Festival is a significant holiday (and the one with the longest history) celebrated in China, occurring on the fifth day of the fifth lunar month. The festival commemorates the death of a popular Chinese national hero, Qu Yuan, who drowned himself in the Miluo River over 2,000 years ago to protest against the corrupt rulers. Legend says that as people attempted to rescue him, they beat drums to scare fish away and threw dumplings into the sea to keep the fish from eating Qu's body.